Gabrielle’s fever has improved and the cultures from her drain came back negative so this is very good news! Gabrielle has been having very frequent seizures and we have more than enough data to establish a surgical plan. It appears that things are localized to the anterior parietal lobe directly behind the motor strip and she is also showing some temporal lobe activity. The doctors will be meeting to establish a surgical plan hopefully tomorrow to determine how to proceed with resection. 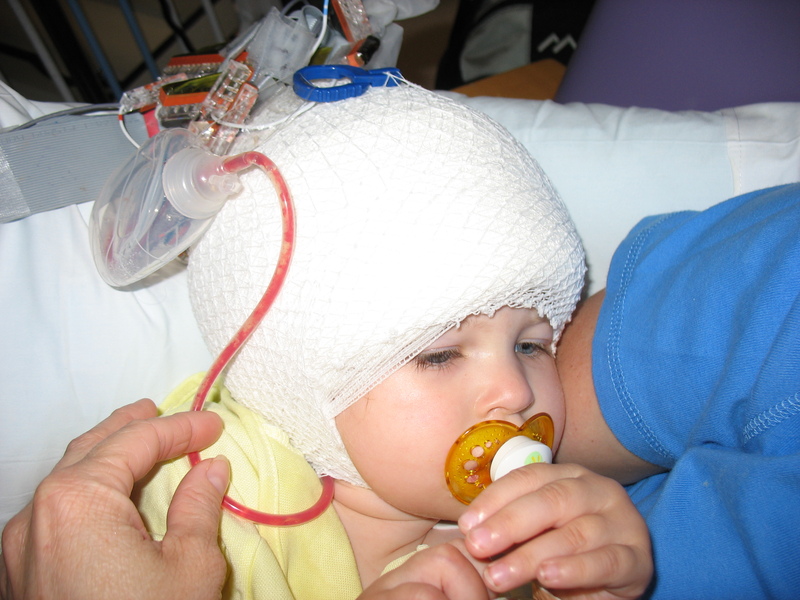 The concerns involve preserving sensory and motor function while removing enough tissue to stop the seizures. The doctors are also looking into moving surgery up if there is an OR time slot available before Wednesday. We will let you know more as the plan unfolds. We continue to pray that the seizures can be stopped with no loss of function and that Gabrielle will not experience any side effects from this very aggressive surgery. We trust that God has a purpose and we trust His plan. Thank you for continuing to pray for our little girl. We know that prayer matters! One of the doctors mentioned that once they have captured about 3 seizures coming from the same area, that that’s often enough to proceed with the resection. Since the grid has been in place, Gabrielle has had over 35 seizures. Yesterday we gave her some additional Klonopin to try to break the cycle. It seemed to help a little bit. So glad to hear that Gabrielle’s fever has improved and that a plan is unfolding. We continue to pray for all of you. We love you. Please know that you are surrounded by a huge circle of prayer as you go through this difficult journey. We are so glad that Gabrielle’s fever is better and there is plenty of data for the doctors to make the best recommendation for her surgery. We are keeping you guys in our thoughts and prayers. I know how long days in the hospital can be. I pray that you and Duff will stay strong, Gabby will continue to improve, and the doctors will have great clarity in their surgical plan. Keep your eyes on Christ remembering He has gone before you in every aspect of this situation. We are lifting you all up every day. God has a plan and he will be exalted through all of this. We miss you all so much. Love to all the kids! Thinking about you guys…by the second.!!!! We’re praying for all of you. We love you!